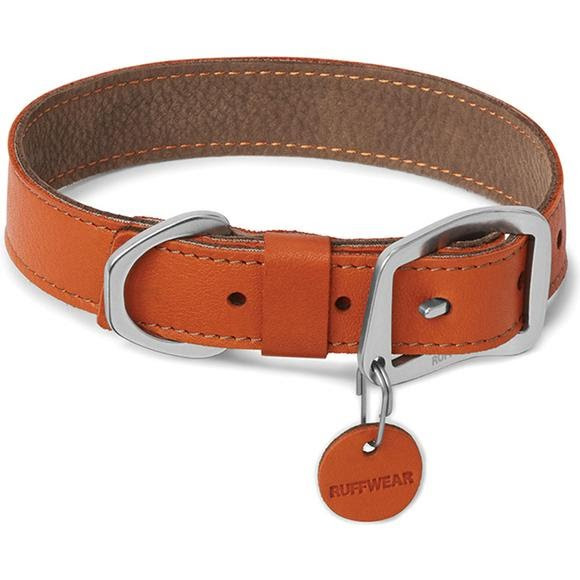 The Ruffwear Frisco Collar is our take on the classic leather collar. Our supple full-grain cowhide leather is water-resistant, durable, naturally odor-resistant, and ages gracefully. Proudly partnering with Pittards, a company that has been ethically and sustainably supplying athletic performance leather in the UK since 1826. The all-metal Crux™ Buckle is our take on the classic equine Conway buckle, offering durability and security in an efficient design. Packed full of Ruffwear&apos;s essential collar features: separate ID tag attachment point with tag silencer, strong and comfortable leather, and aluminum D-ring. Measurements 14-17", 17-20", 20-23", 23-26"